The Modern Matte Silver merchandising display system features a sleek, powder-coated silver finish with a substantial faux-wood bases. This system can be rearranged season after season to accommodate your display needs. 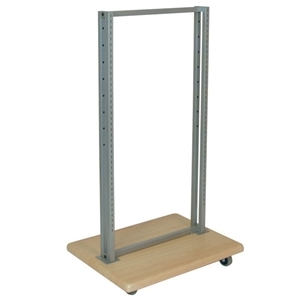 The frame base will accept 4 arms for all hanging, or arms and shelving brackets for a combination of hanging and shelving, or add shelving brackets to both sides to create an all shelving unit. Great rack ... would be even better if the company drilled guide holes for all 4 screws on the bottom of the wood instead of only 2!